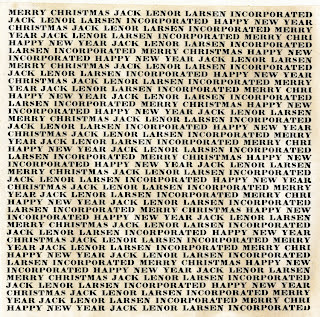 On Dec. 14, 1956, John Cage submitted an invoice to Jack Lenor Larsen related to his work for Jack Lenor Larsen, Inc., an exciting upstart textile firm in New York City. The total amount was $9.77, reimbursement being requested for the cost of newspapers ($3.60), paper-fasteners ($5.67), and "Mother's" paper bags ($.50). For Cage, the work had been a pleasure, and in his brief letter he expressed the hope that Larsen would call on him again. As he added at the close, he was again near "financial zero," and trusted that Larsen would expedite payment of his invoice. 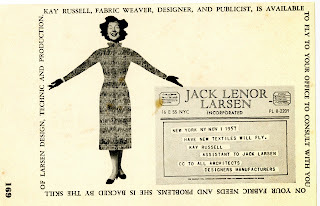 On Aug. 14, 1957, some eight months later, Cage received a letter from one Manning Field, who, on behalf of Jack Lenor Larsen, Inc., offered him a contract for continued services. The deal was this: $400 a month for Cage's services as graphic artist/stylist for the whole of the company's advertising and promotion program. The period covered by the contract was July 1 - Dec. 31, 1957, during which Cage was expected to style, execute, and arrange printing and placement of the company's advertising and mailing program; he was also expected to assist in planning the advertising program for the following year. It's been long known that Cage did work as a graphic artist for Jack Lenor Larsen, Inc. in the mid-1950s, but details were scant. 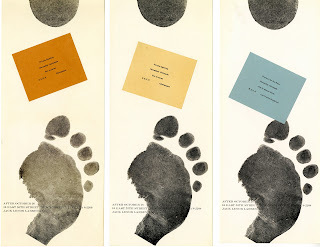 (Cage had, at the time, designed many posters and fliers for the Cunningham Dance Company's early performances, which exhibited a unique design sense.) So, it was with great delight this past month, while conducting research at Wesleyan University Library's Special Collections and Archives, that I discovered a number of folders containing correspondence between Cage and Larsen, as well as numerous examples of Cage's work. These included stationary and business cards, invitations, ads, and even a company Christmas card (seen above). * Naomi Yang**, long associated with the John Cage Trust as its inspired designer, serendipitously stopped by, and we were able to peruse the materials together. Below are a few samples of Cage's work, with Naomi's side-bar thoughts, from a design perspective. 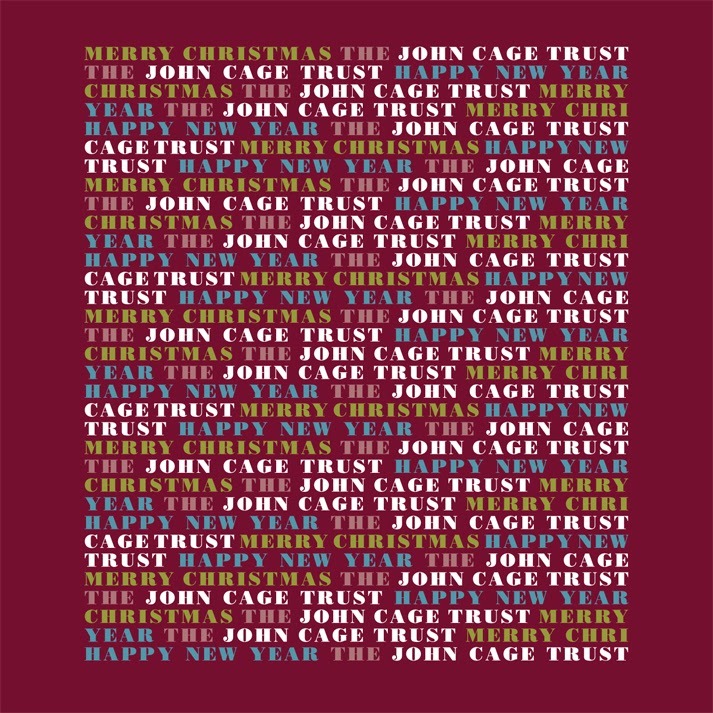 *Cage's initial thought for a holiday card was a charming if ultimately impractical hand-cut paper snowflake placed in a small handmade Japanese style box upon a small piece of one of Larsen's fabrics. Click here for a fun interview snippet ("The snowflake will know...") for more about this. **Naomi is also an inspired Indie musician, who, with her husband Damon Krukowski, joined forces with Dean Wareham in Galaxie 500 and later formed Damon and Naomi. Naomi loves the playfulness of this ad. Here, Cage used the actual ticket from the press show, but replaced portions of the original text with ad copy. He also typeset additional ad copy into the form of an "envelope," in the manner of Pattern Poetry. 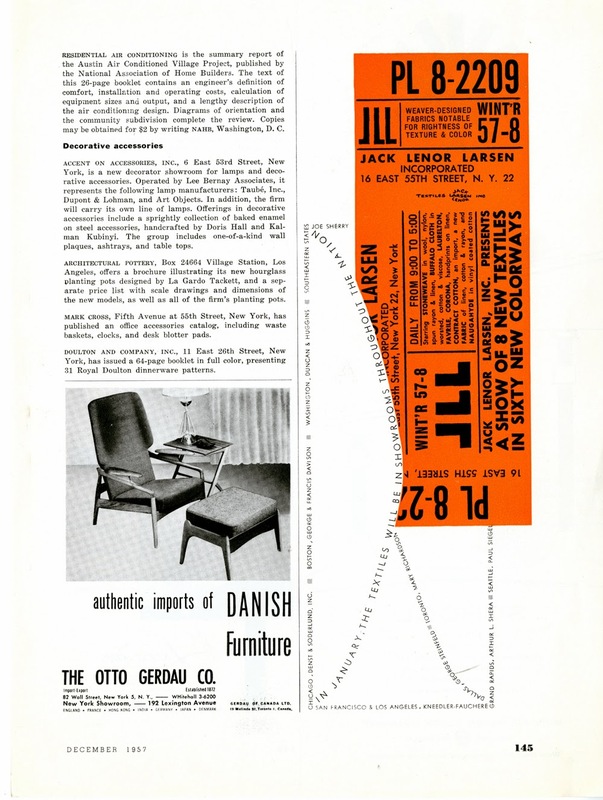 She especially enjoyed seeing this ad in its original context, its bold, graphic character strikingly juxtaposed against the staid, modern design of the rest of the page. 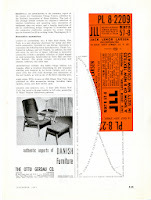 The proof to the right is of an ad created for Interiors magazine, where, along with Interior Designs, much of Cage's work appeared. 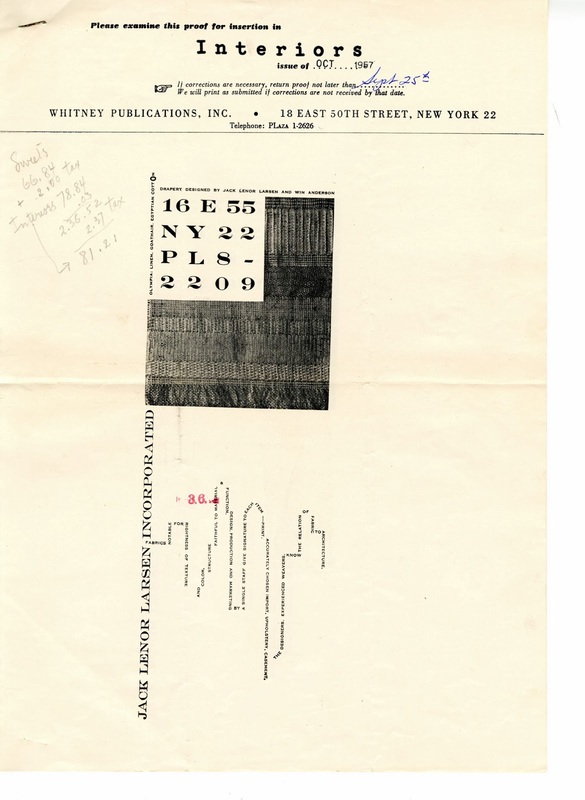 Here, Cage constructed an image of a flag flying over a city skyline, the skyline itself constructed of ad copy. Naomi notes how Cage freely placed words in any direction, regardless of their "readability," and also how he used letterforms as shapes. Note, for example, the final "O" in the word "cotton" on the upper left, which is typset larger than the other letters to serve double duty as the finial on top of the flag post. 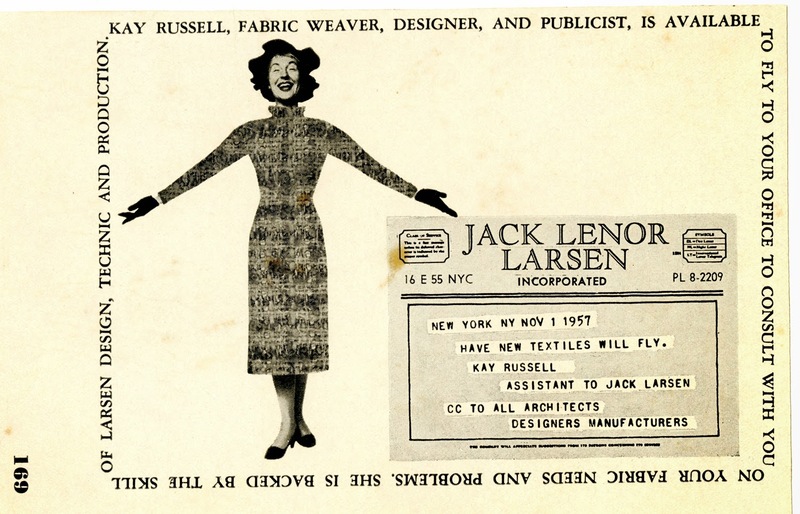 Here's another playful design -- a "fake" telegram that incorporates a cheerful collaged figure of designer Kay Russell dressed in a textile outfit and framed by a border of ad copy. Judging by the placement of the page number at the bottom left from this clipped ad, it seems that Cage either designed this ad without regard for the vertical orientation of the page, or else simply permitted it to run that way, regardless of page orientation. Naomi laughed delightedly when she saw this envelope, which she's quite certain caused the original printer's heart to sink. Cage placed the return address on the back flap, right against the fold at the top edge, permitting absolutely no margin of error in the printing process. A totally "dangerous" design from a printer's point of view! When sealed, it must have been very striking to have this minuscule line of type precariously perched at the very edge of the paper. Further, after opening the envelope, all trace of the return address likely disappeared into the torn edge! This invitation to the right, consisting of a printed footprint and individual invitation cards, reminds Naomi of certain Fluxus pieces that were to come, ones wherein body parts were used to trace markings in paint along the floor. She also enjoyed the mischievous juxtaposition of champagne and bare feet at a fancy private opening. 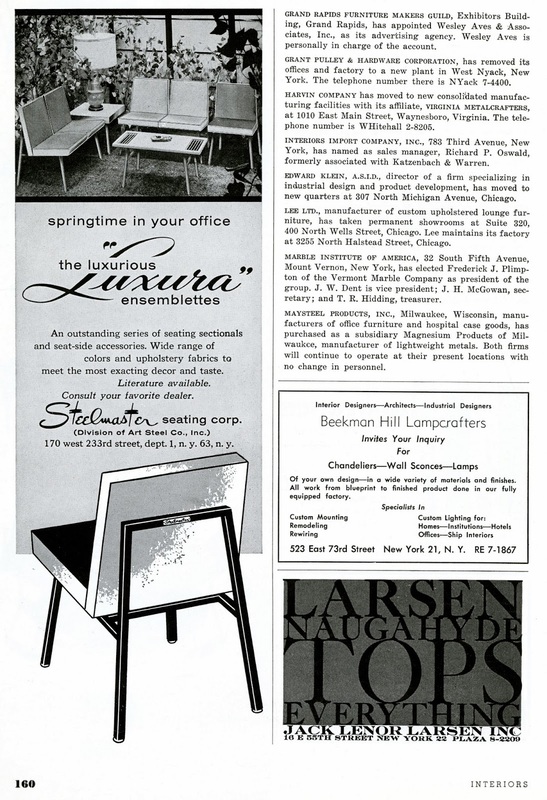 Cage's "Naugahyde ad" seen here, which would serve as the basis of an ongoing series, is positioned in the unassuming lower right corner of the page, with a delightfully high concept play on words: "Larsen Naugahyde Tops Everything." Despite their small size, and through the use of a relatively dark background and unusually large type, these unassuming ads were quite effective -- jumping off the page, demanding that you read them twice. 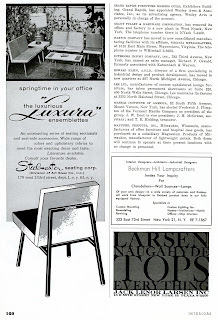 As Cage's contract was about to expire, he again wrote to Larsen, who was then in China, on Dec. 20, 1957, asking whether his work for Jack Lenor Larsen, Inc. was to continue. Ten days later, Larsen replied with not one but two lengthy letters, beginning the first with the observation that his house in Taichung was "...less what we like to think of as being Oriental than your setting at Stony Point." The first letter was a somewhat gentle critique of Cage's work for his company, having much to do with what he felt was Cage's inability to differentiate between work he should do himself and work he should delegate to others. The second, dated just three days later, was far more stern and direct. Much of the actual substance of Larsen's second letter is explicitly addressed in Cage's reply (below), but in the main Larsen expresses ambivalence about the success of Cage's work as a whole, and also asks how Cage plans to complete the work that was left incomplete at year's end, without additional payment. Thank you for the letters of Dec. 30 and Jan. 2. I gather that in employing me you wished to complete a "circle" of work (having "integrity," etc.) of which a certain few jobs have been a "crescent." Now that the period of our agreement has expired, you suggest that I would be failing as a "gentleman and fellow artist," lacking in "good spirit," if I did not proceed with the work taking as payment only "experience and successful lasting relationship." Several other points are made in your letters which seem to fall either into a cursory vocational psychoanalysis of me (I work too hard, should be more efficient, get too involved, etc.) or an indication of displeasure with works done, -- ads which now appear to you "unsavory" -- the Xmas Greeting which you now request me to justify. Incidentally, you ask for one to be forwarded to you. This is impossible. 2000 were ordered and sent out. There are no more, nor the materials to make more. As far as payment to me for work done goes, you mention two agreements, one "raised to 2500 dollars" and the other "outside contract Xmas project." Let me answer the above in reverse order. By interpreting 2500 dollars as $400/month, the Company saved itself, and deprived me of, $100. And, in order to complete the Xmas project (Greetings, Gift Wraps), I had to employ others, so that in the end I made virtually no profit. Note that I am not complaining, since it was part of our agreement that I would take the consequences of my plan for the Xmas Greeting. I consider your present dissatisfaction with works done irrelevant, for they were all accepted by you and generally worked upon in collaboration with you. Let me add in parenthesis that I am not ashamed of any of the work done nor do I see any need to justify any of it. Furthermore, I am told by many that the work I have done is brilliant, the best in the field, etc. Neither blame nor praise impresses me since I know that I simply did what I could in good faith. My methods of work are intimately my own. I see no value in being an "idea man" and not having a finger in production. For at the present time in this society, nothing is done as one intends unless he does it himself, or stands closely by its being done. The stationary presents an excellent example: the idea is "superb," but the realization is unfortunate. At any rate, you now know something of how I work and you can either engage me or not as you choose to do further work. That I worked "too hard" is evident to both of us. From October 1 on I can exceed your 120 hrs a wk. with my 126 hrs. I was unable to return to Stony Point until Dec. 20. And this was not all Xmas work, but ads, misc. items commissioned by you, 4 hrs. a wk. for teaching, and around 6 hrs. of dance rehearsals/wk. I have enjoyed the work as I say in my letter to you of Dec. 20, and would welcome continuation. In fact, I am still working on the Feb. Interiors ad which has met many obstacles in its production. 13 days of the present month will have been devoted to the Company's interests without recompense to me. Furthermore, the ad (Naugahyde format) represents a program and has a copy which I do not profoundly endorse. My sense of liveliness is other than the "continuity" you insist upon. However, to repeat, I would willingly continue working for the Company, but I literally cannot afford to do so, since no payment is forthcoming. I would need money to stay alive, move about, and nourish myself. Finally, that the contract has expired and work remains to be done is simply an accurate statement of fact. I did all I could and it was insufficient, though I provided the expected assistance in planning future work (the Naugahyde ad can, as you have pointed out, germinate a multiplicity of results). This fact that I did all I could and it was insufficient must be seen squarely. No court of law would judge me guilty for I have many witnesses of my constant activity in the Company's interests. And, in money terms, one single job, the Sweets Catalogue, could have cost the Company as much or more than was involved in the 6 months agreement. If you have no more money to spend, you must see that you cannot afford what you would like to have in the way of services. In this connection you should know that the Company has contracted for 12 ads in Interiors, 6 in Interior Design, that unless these contracts are fulfilled the costs of previous ads go up considerably. (I.D. is in fact alarmed over the program as it so far relates to them having expressed to me their thought that the Company's relation to them has a history of promises made only to be broken.) Furthermore, I should, if I were still employed, be making the ad to meet the Feb. deadline. You apparently have no conception of the time that goes into the production of one of these ads. I suggest therefor that the Naugahyde ad be repeated in the March Interiors (Feb. 5 deadline) so that the ad program may remain in effect, and economically so. You may be imagining that I have been overpaid and that I have saved money during the past 6 months, and you therefor speak of my "retentative bent." Such is not the case. My parents were dependants and still are. My necessity at the moment is to find remunerative employment. 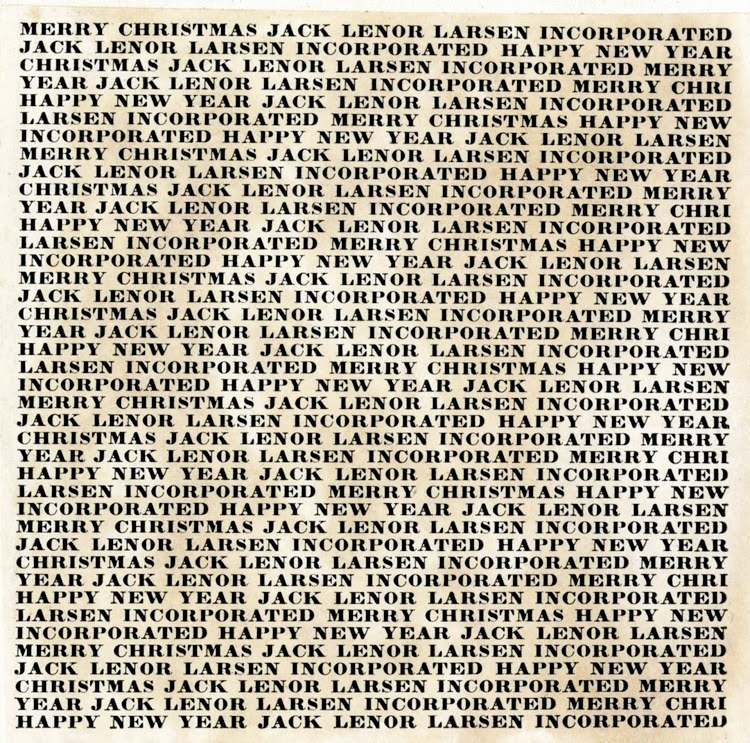 Cage's work for Jack Lenor Larsen, Inc. ended on Dec. 31, 1957, as per the term specified in his contract. 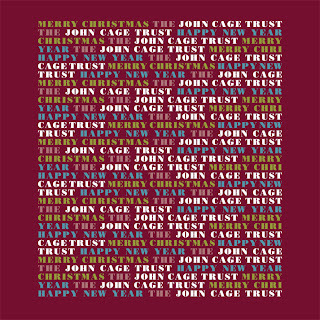 And although Larsen was dubious about the "recognizability" of Cage's Xmas greeting, we at the John Cage Trust love it. We decided to use it as the basis of our own Christmas card this year, to be sent as an eblast. (For those of you oddly not on our mailing list, drop me a line and I'll happily add you.) Here it is, reinterpreted by none other than Naomi Yang!